We tested Google Assistant on iPhone at Google IO 2017, and walked away as impressed as we were with it on the Google Pixel – except for one major flaw. You can't open up Google Assistant hands-free from the lock screen or the home screen. You need to open the app first – and Apple doesn't allow rival voice assistants. There is one way to summon Google Assistant hands-free from any screen, but it's an ironic workaround: you have to ask Siri to open the app for you. Immediately, asking Siri to open Google Assistant felt as awkward as asking an ex for their arch-rival's phone number. "Can you open up Google Assistant because you're not good enough?" "Can you open up Google Assistant because you're not Goodnuf?" Ugh. Too often, Siri refuses to hear us correctly. This is why we need to see other machine learning tools. Asking Siri to "Name this song" in the car sometimes just play songs – and it plays the one album I still have on my iPhone since switching to streaming (the U2 album that Apple forced onto users via iCloud). That's... not helpful. 'She has a nice name' – This is what Google Assistant thinks of Siri. Nice or snarky? Similarly, when we asked Siri to shut off all of our alarms today, it just read every single alarm we have ever set on our phone. It's missing the 'I' in 'AI' on this one. Siri has been a great voice assistant for me a long time. But we've drifted apart. We're just not connecting like we used to. This is why we need to see other machine learning tools. 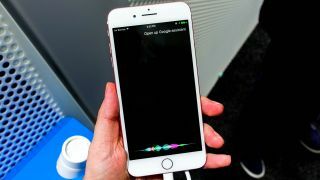 At least until iOS 11 and the rumored Siri Speaker give Apple's voice assistant a major upgrade.